Because green tea is made from unfermented leaves, it contains higher concentrations of antioxidants which fight inflammation and damage in the body, according to the University of Maryland Medical Center. In addition to the refreshing taste, green tea also offers numerous health benefits. While it is naturally a low-caffeinated drink, the decaffeinated version doesn't interfere with sleeping and behavioral habits while still offering health benefits. Green tea is packed with a form of antioxidants known as polyphenols which fight free radicals in the body. Free radicals circulate in the body and cause cell damage, DNA mutation and cell death, according to the University of Maryland Medical Center. The noticeable signs of this are aging and disease, including heart disease and cancer. Green tea can both fight free radicals and may also be helpful in reversing the damage they inflict on the body. According to the World's Healthiest Foods, drinking green tea has been shown to reduce the chances of developing coronary artery disease. When you drink at least five cups of green tea a day, enzymes that can otherwise damage arterial walls are neutralized. Consuming five cups a day has additional heart health benefits, including a 31 percent lower risk of dying from cardiovascular disease in women and 22 percent lower risk of dying from cardiovascular disease in men, according to the World's Healthiest Foods. High blood pressure, also known as hypertension, can contribute to a number of health problems, including heart disease. According to the World's Healthiest Foods, drinking anywhere from 1/2 to 2 1/2 cups of green tea per day can lead to a 46 percent lower risk of developing high blood pressure. Those who drink more than 2 1/2 cups per day experience a 65 percent lower risk of developing hypertension. Type 2 diabetes involves insulin levels that do not react properly to consumed foods. According to the World's Healthiest Foods, drinking green tea every day for 12 weeks results in improved insulin sensitivity that allows the body to better react to ingested foods. 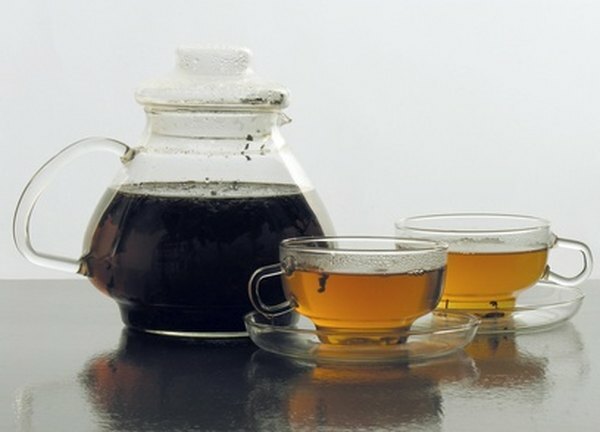 Researchers have found that epigallocatechin 3-gallate, found in decaffeinated green tea, reduces the number of messenger RNA molecules that affects liver cells, causing them to produce enzymes that create glucose. Glucose and insulin work together in the body to extract energy from food. CNN.com: How Healthy Are Decaf Green Tea and Dried Fruits?